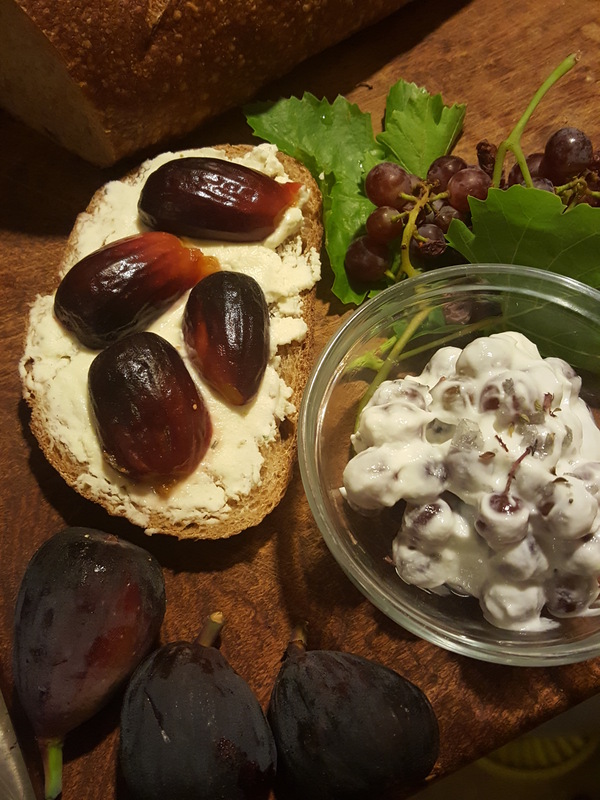 Hi, Amy here today, giddy with a pile of fresh figs and fresh grapes! The Black Mission figs are from a very old tree in my mom’s yard. My mom dries them in a hot car and freezes them to preserve. This year I decided to try pickling some. I poured about one cup red wine vinegar into a pan, along with two tablespoons sugar and a teaspoon salt. 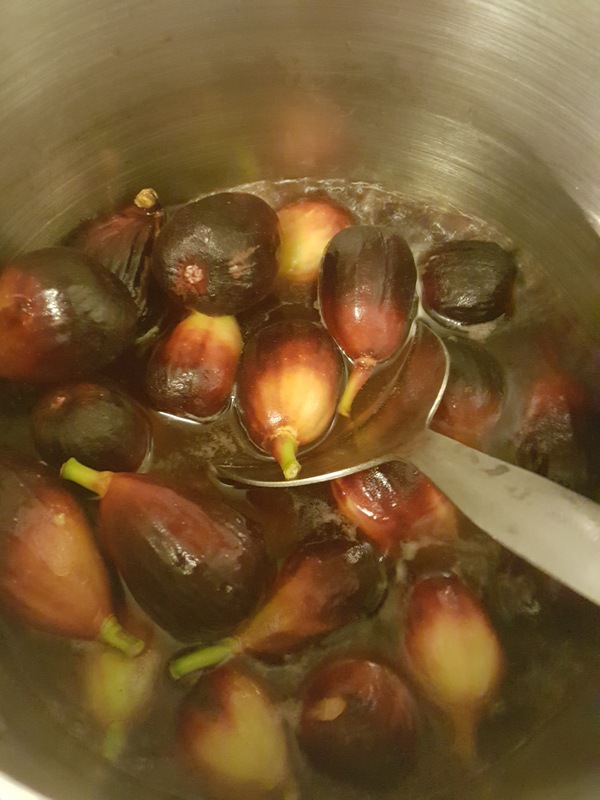 Then I tossed in about a dozen fresh but firm figs and brought them to a simmer. I’m sure honey instead of sugar is fine, and any vinegar would work as well. You could add more or less sweet or salt to suit your taste. Quick pickles are as forgiving as they are delicious. After simmering for a few minutes, I let them cool in the liquid. 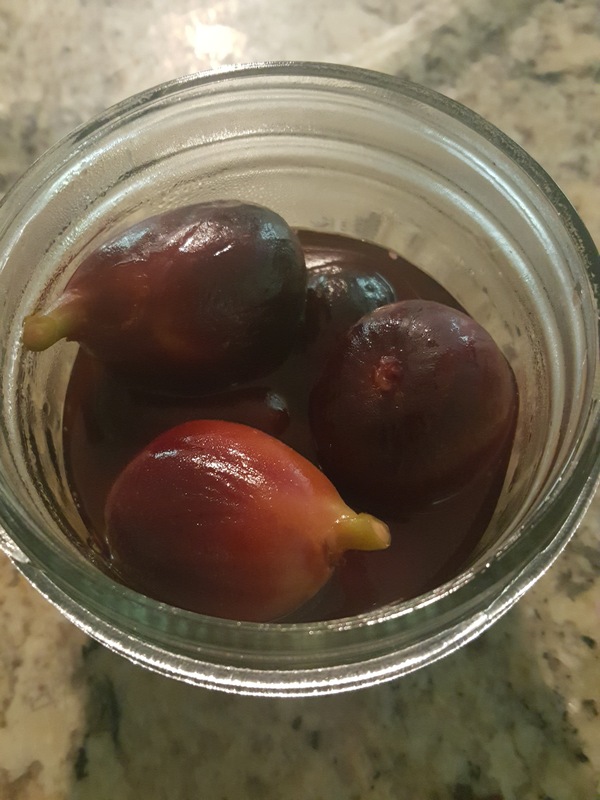 I refrigerated the figs and brine together, where they softened and darkened a little more. Perfect. 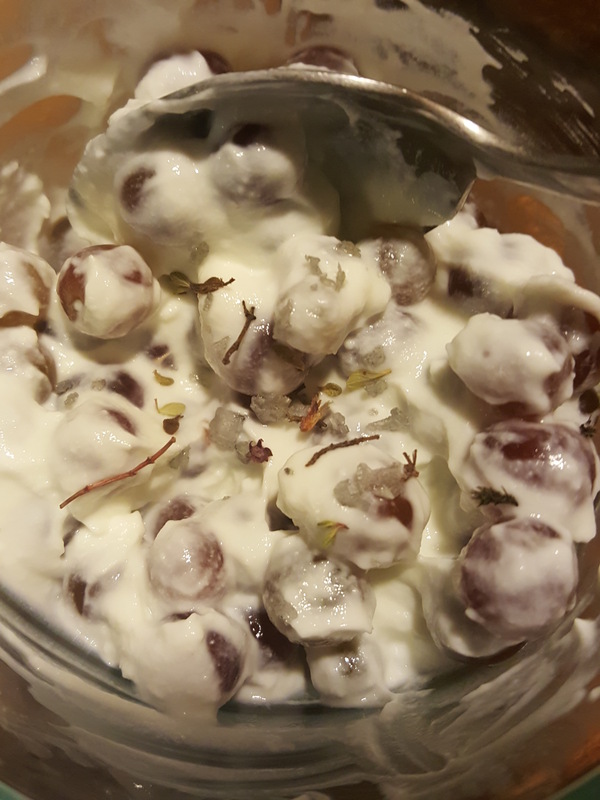 A few days later, a friend shared some seedless grapes from her garden. Amazing!!!! You can see some turning to raisins on the vine. 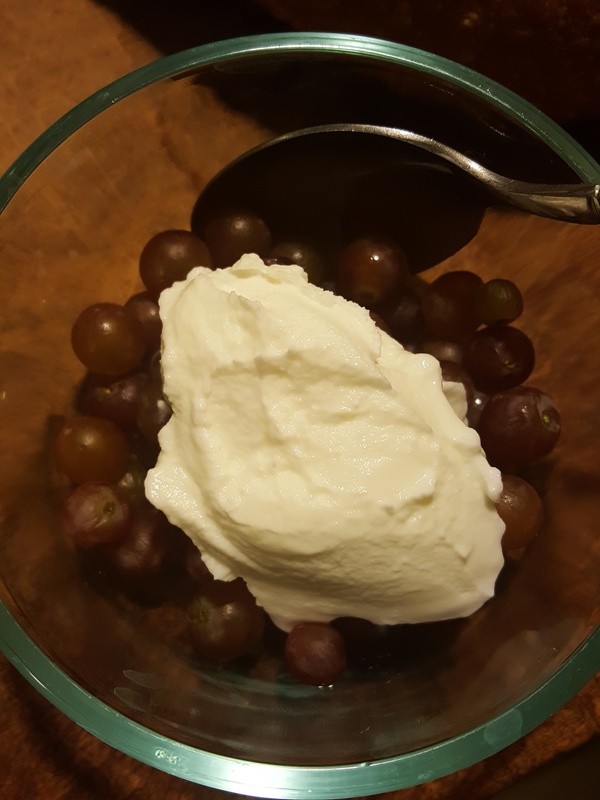 For a fresh, light meal, I put stemmed grapes with some tart Greek yogurt. I sprinkled some sea salt thyme blend and called it a salad. Of course, any salt and herbs would be wonderful here. 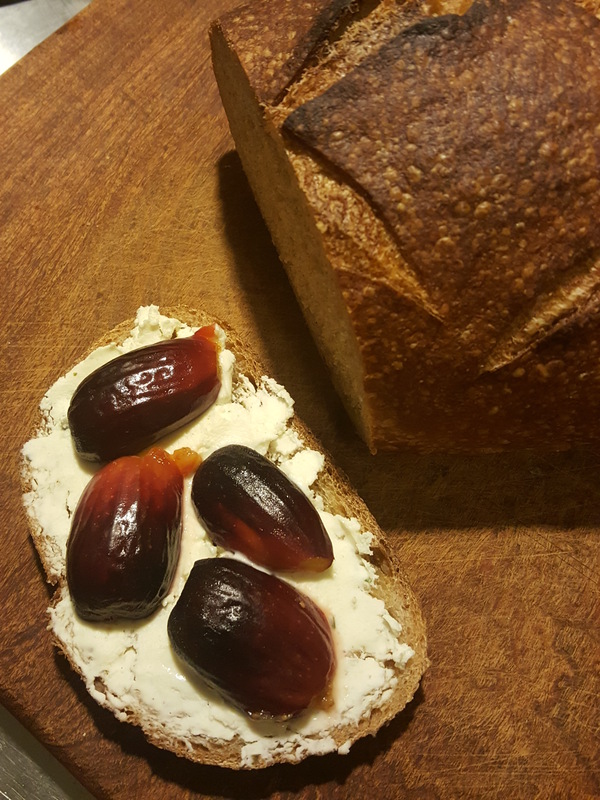 For a sandwich, I spread Black Mesa Ranch goat cheese with herbs on a slice of Barrio Bread whole wheat levain (both from Tucson CSA) and topped with halved figs. Dinner to eat while watching the clouds and sunset. Here’s to hoping for more summer rains in the desert! 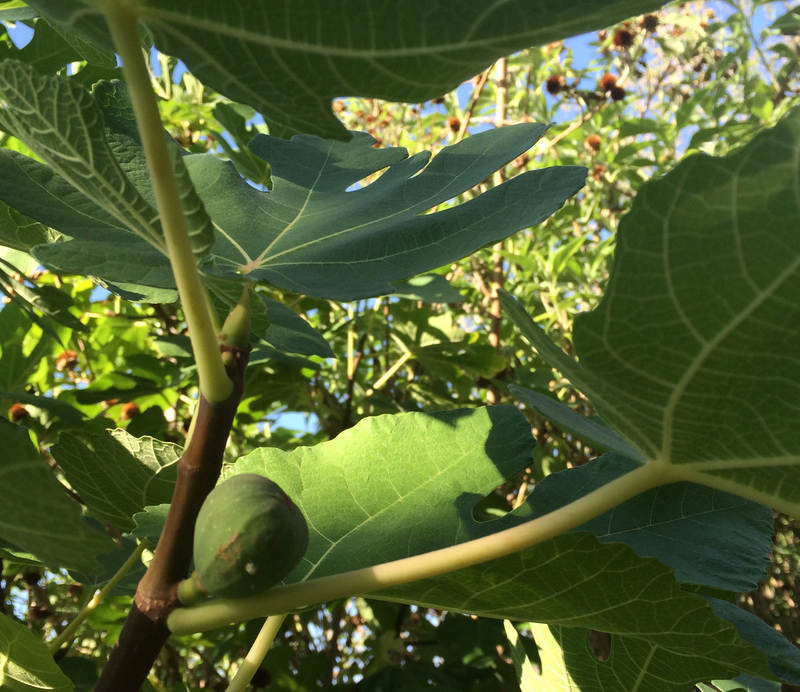 Hello, Amy here excited about figs and sweet corn this steamy Tucson summer. 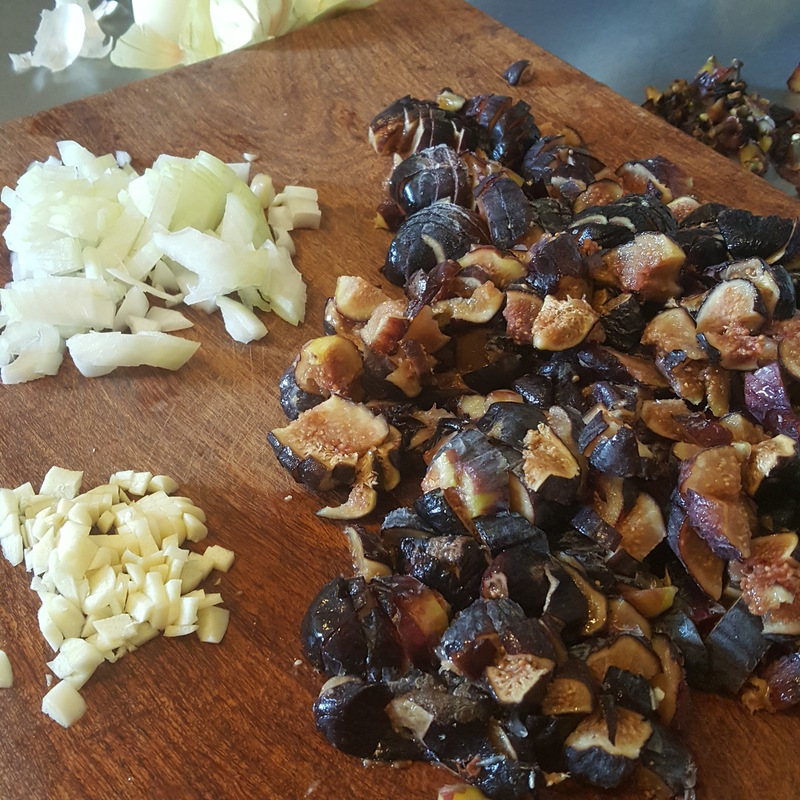 We’ve cooked figs before, and I’m going to make Carolyn’s fig bars next. But normally my preference is for savory food, so today I made a savory, sweet, sour, spicy chutney. 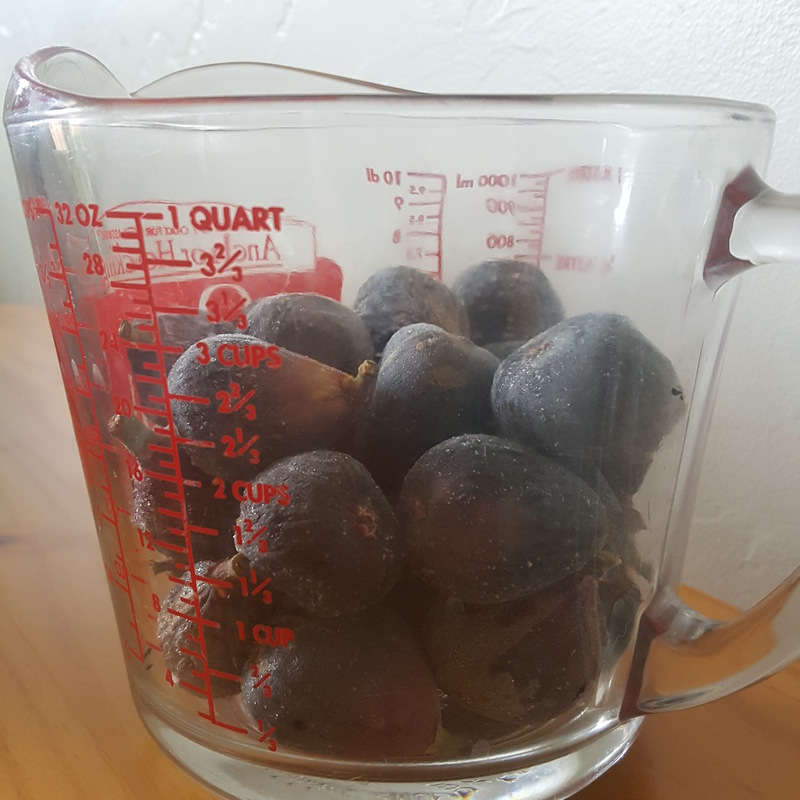 I started with gooey ripe black mission figs from my Mom’s tree. 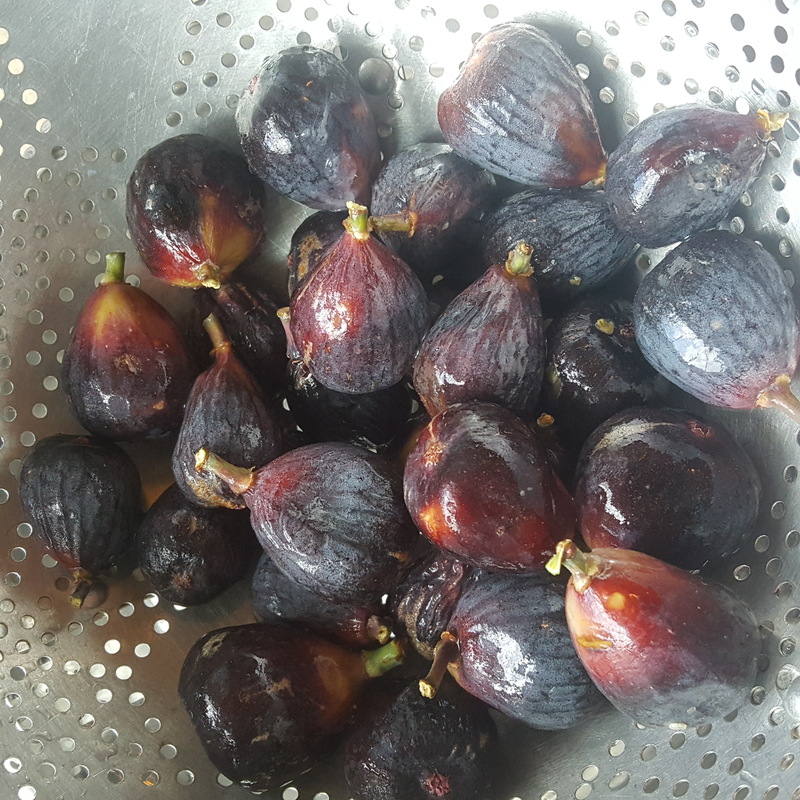 After a rinse, I trimmed the stems from the figs and chopped them. Then I chopped a bit of onion and garlic. 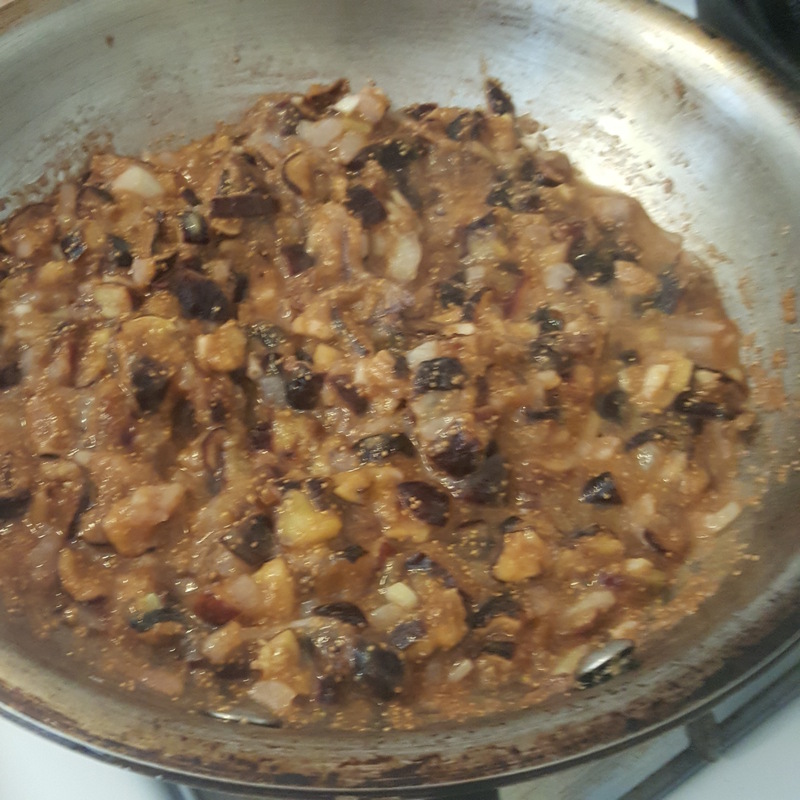 I softened the onion and garlic in butter, then added the figs and a splash of water only as needed to keep it from burning. 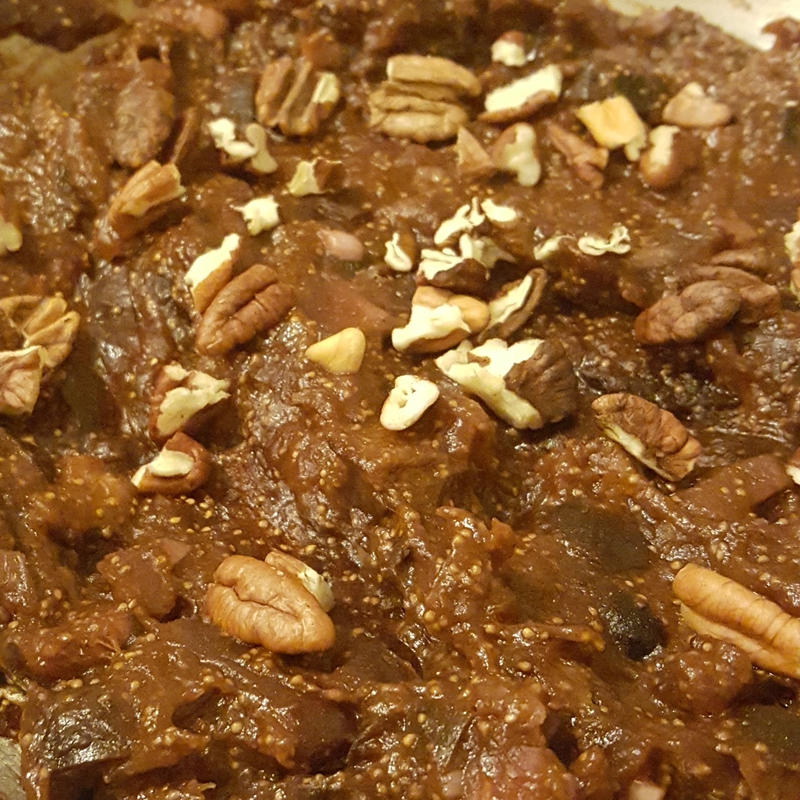 Apple cider vinegar and a dash of salt and black pepper wasn’t enough spice, so I added Mole Dulce powder. 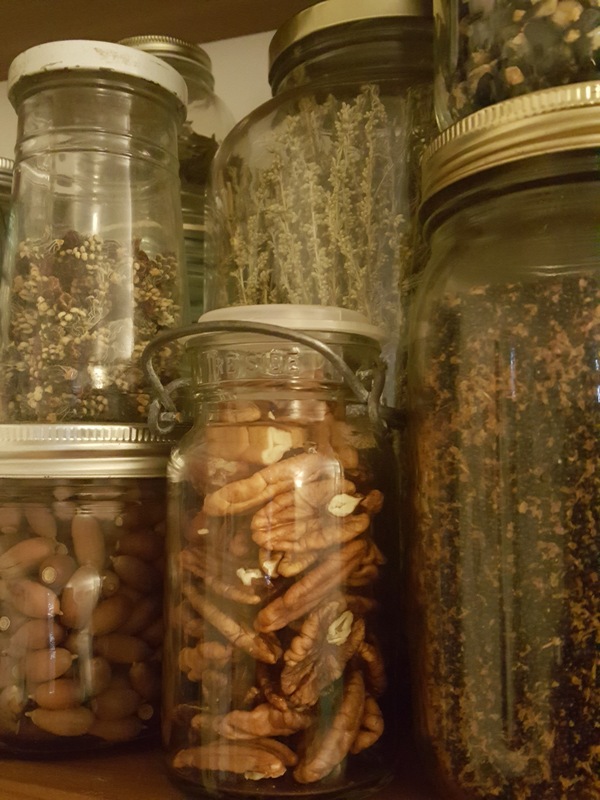 Staying indoors in the heat of the day, I’ve been organizing my pantry, removing the stems from dried herbs and shelling nuts. I had a few ears of sweet corn and a basket of cherry tomatoes from Tucson CSA/Crooked Sky Farms. First I grilled the shucked ears to give them a toasty flavor and color. On this rainy day, I used a cast iron grill pan on my indoor stove, but it would be better outside, of course. 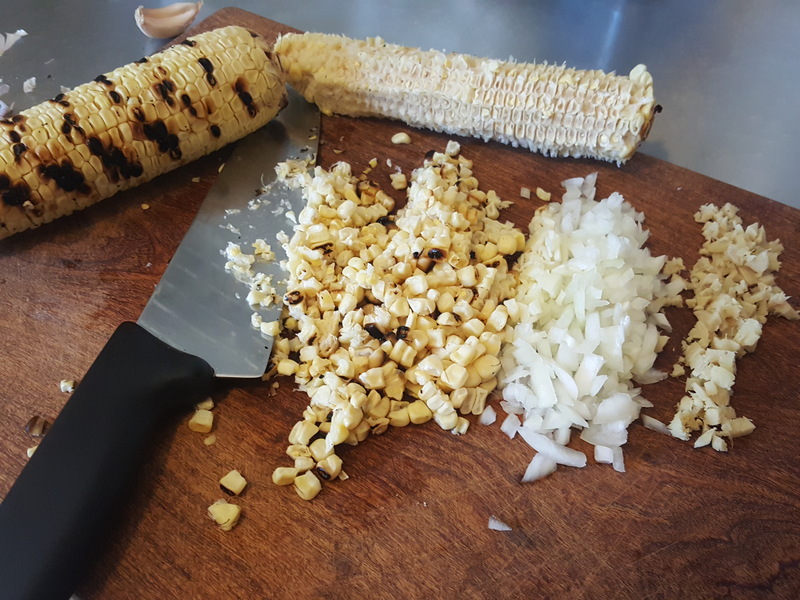 I cut the kernels from the cobs and froze the cobs for making soup stock. In a frying pan, I sizzled up some cumin seeds in oil, followed by onion and garlic. 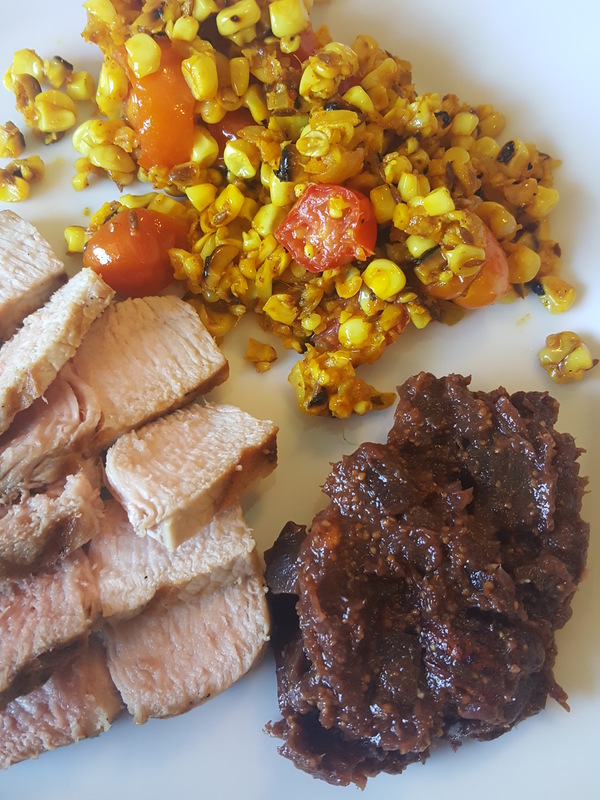 Corn, halved tomatoes, turmeric, red chile and salt went in the pan and came together quickly over high heat. You can never go wrong with fried corn. 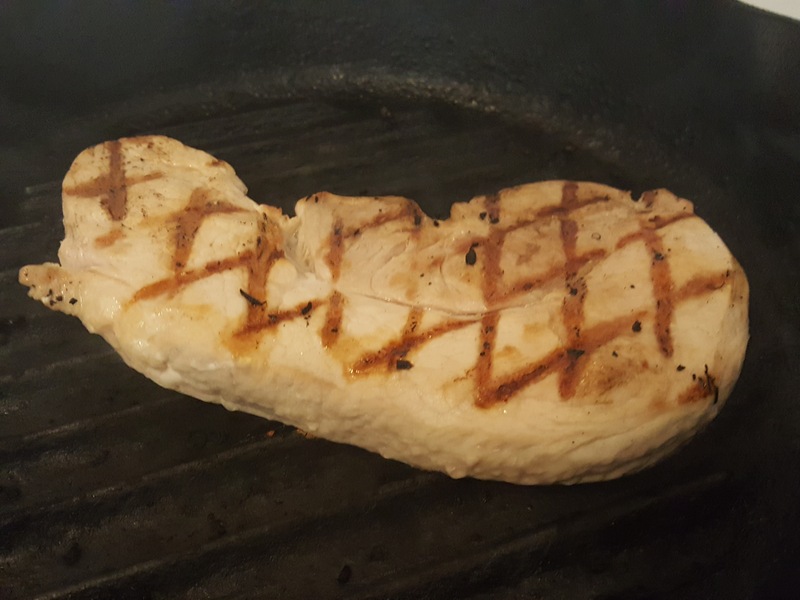 A pork chop in the grill pan completed the meal. Soften the onion and garlic in butter. 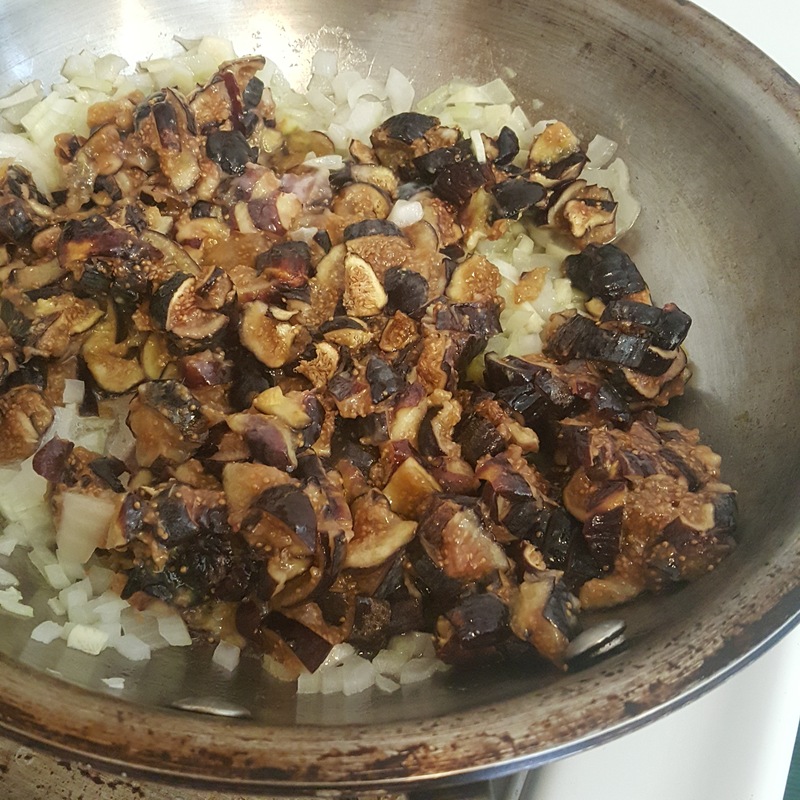 Add the figs and cook until softened, adding a tablespoon of water as needed to keep the mixture from sticking to the bottom of the pan. 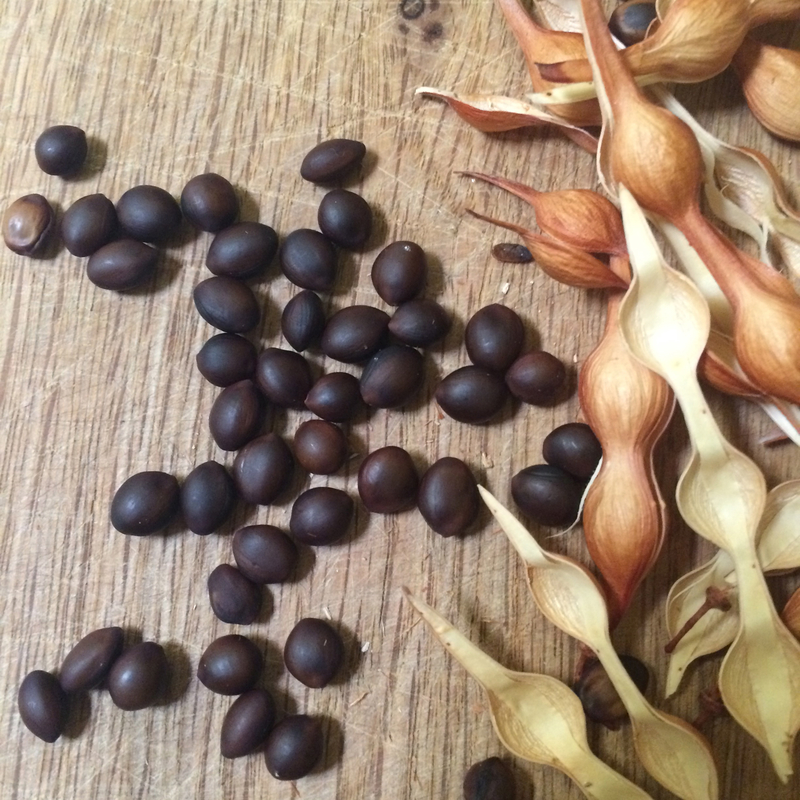 Season to taste with salt, vinegar and Mole Dulce. Finish with pecans. 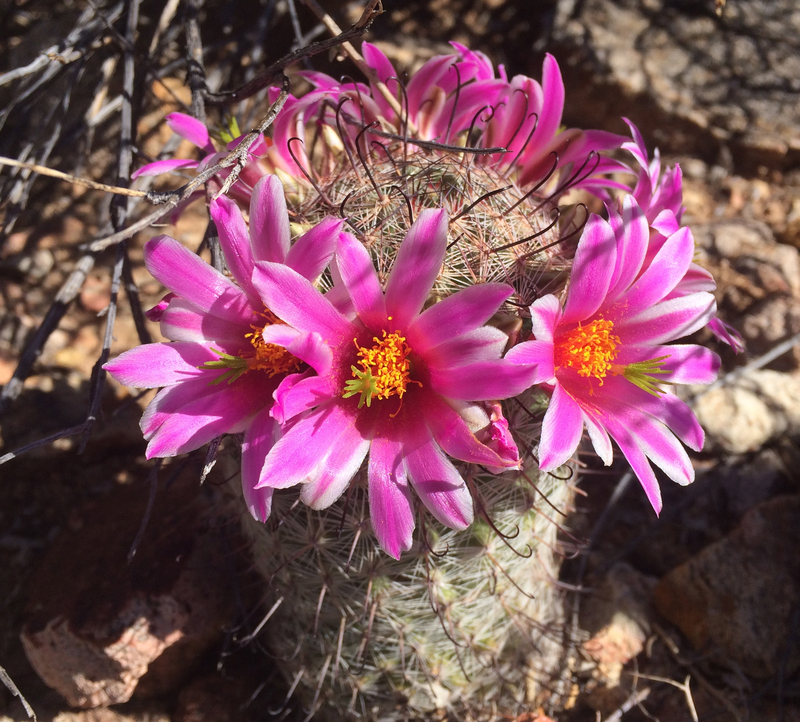 Crowns of Mammillaria flowers make pink arches like miniature 4th of July fireworks now suddenly visible among desert rocks and under greening bursage. They are rain celebrations–the PROMISES of fruits to come! In a few weeks the little fishhook pincushions will sport a crown of shiny red fruitlets. Keep watch for them. 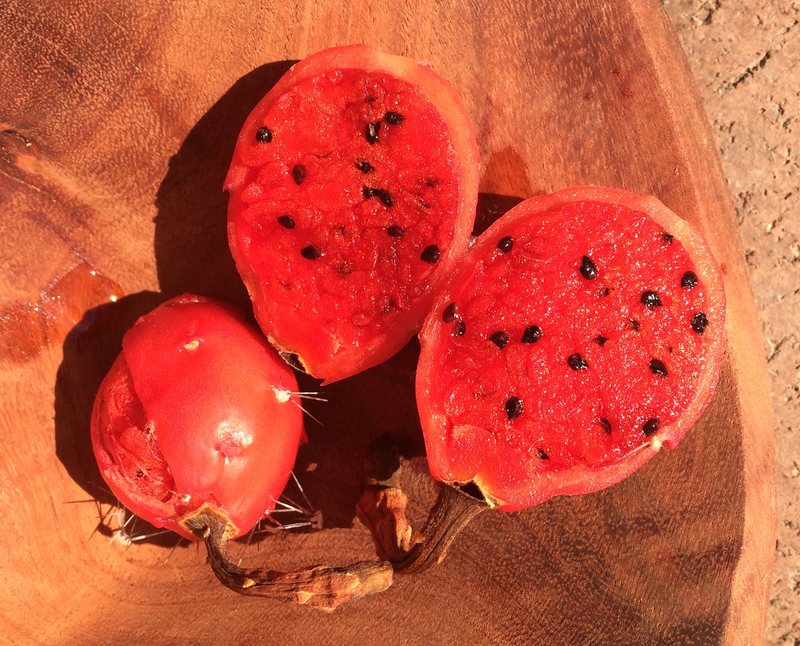 Known in Sonora as pitayita de raton (little mouse’s pitaya), each long red droplet will give you a sweet tangy zing– like a mini-organpipe-cactus fruit. Tia Marta here to share ways of enjoying the cornucopia that is beginning to spill out flavorfully all around us in town and out in the desert in this monsoon time. 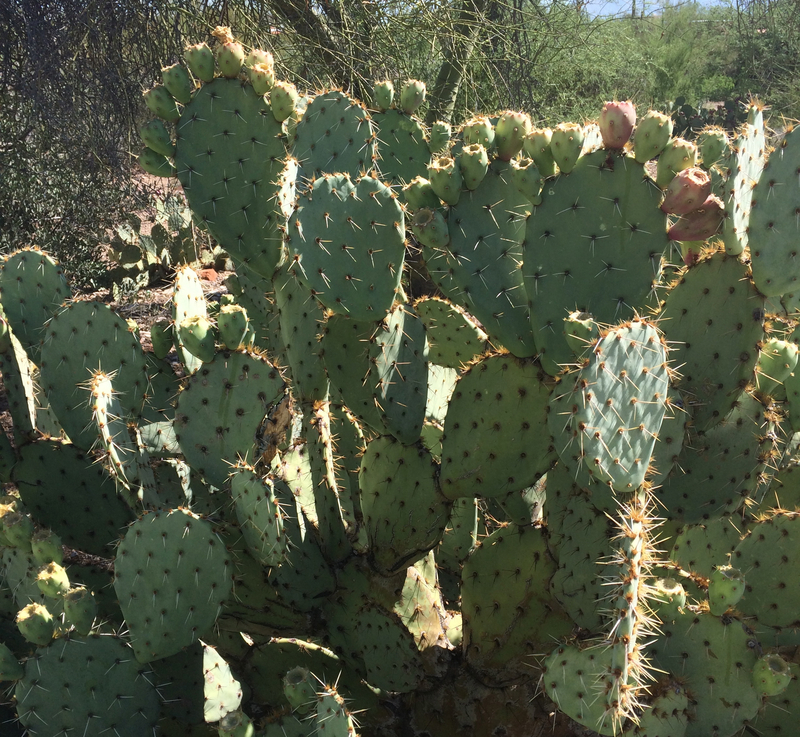 All around the desert and through every neighborhood, I see the promise of a good prickly pear harvest, inspired by our elongated spring and nurtured by good monsoon rain. 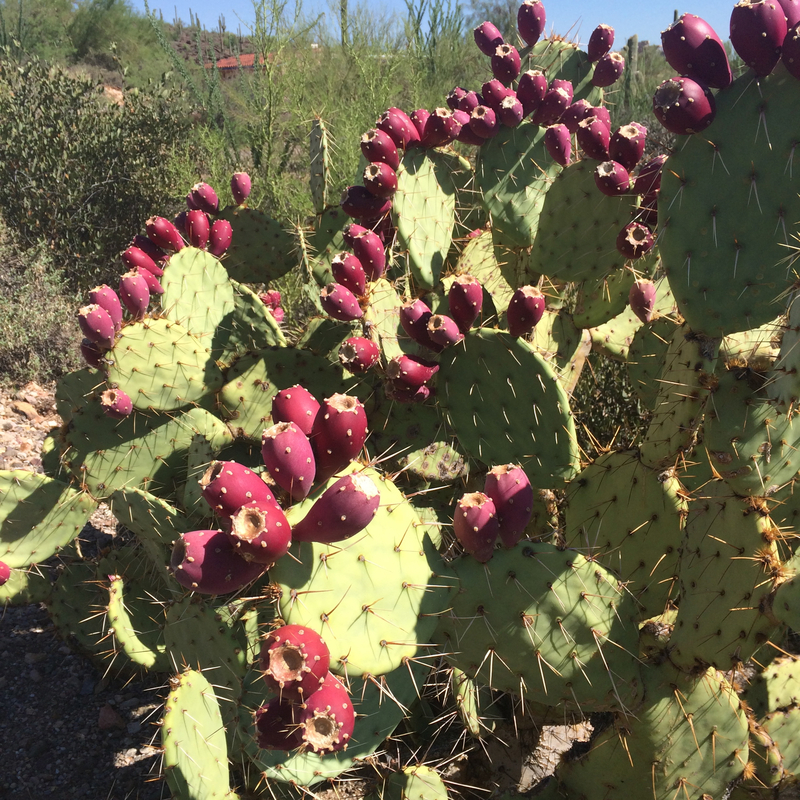 Each prickly pear seems to march to a different drummer. Right now you can see every shade of color–unripe to ripening tunas–very green, to rosy, to deepening red. These are PROMISES so don’t jump the gun! They are not ready quite yet–but this is the signal to get your kitchen PREPARED. 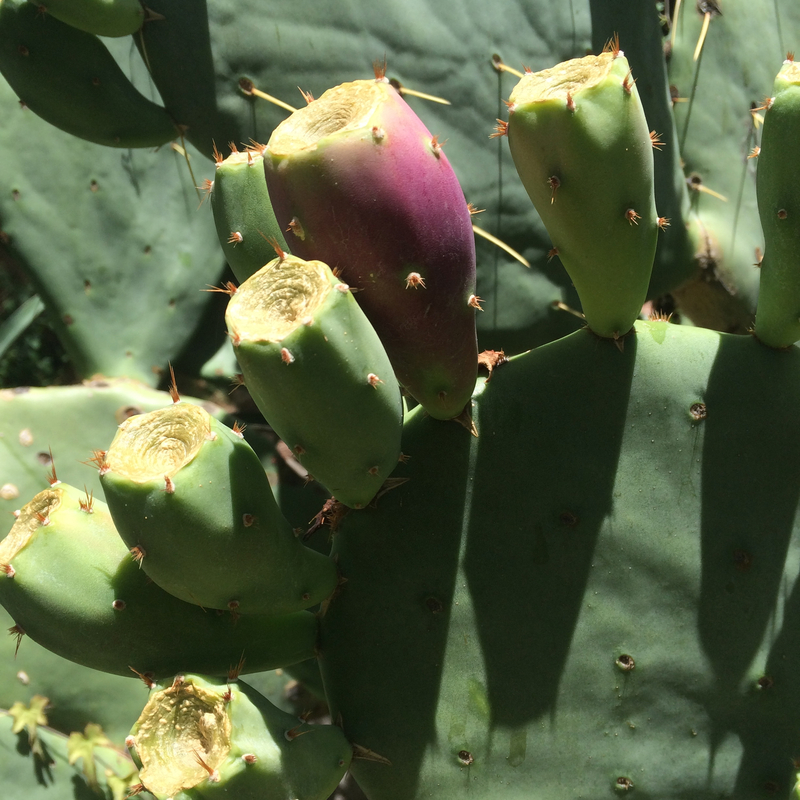 Stay tuned–There will be more blog posts to detail prickly pear ideas in coming weeks. Make space now in your freezer, and make time on your calendar for the August TUNA HARVEST. 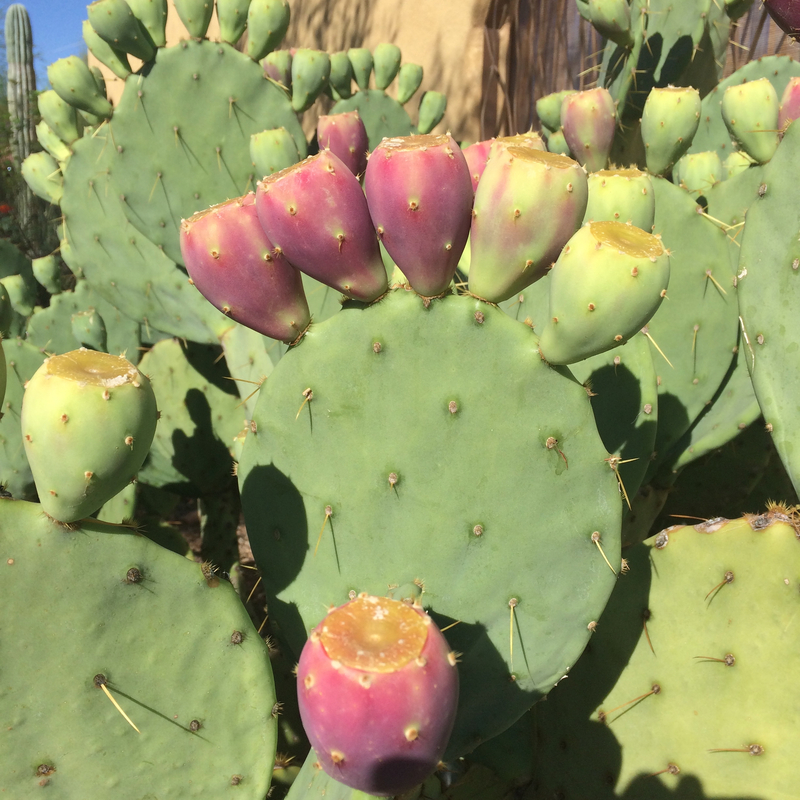 Opuntia engelmannii full of ripening fruit–But don’t salivate yet (week of July 8)! Wait for a dark maroon color to extend all the way to the bottom attachment of the tuna AND through the tuna‘s entire interior before they are fully ripe and ready to eat or cook. What a glorious monsoon our Sonoran Desert has enjoyed over the last couple of weeks! The explosion of life in such a short time is astounding on the heels of record-breaking heat and drought. This is when the desert shows its tropical heritage with a surge of energy, fecundity, productivity. Isn’t it interesting that the “outsider’s” view of the desert is of hazardous scarcity? More interesting instead is to understand and appreciate the waves of nutritious plenty that can erupt suddenly here in the Sonoran Desert. 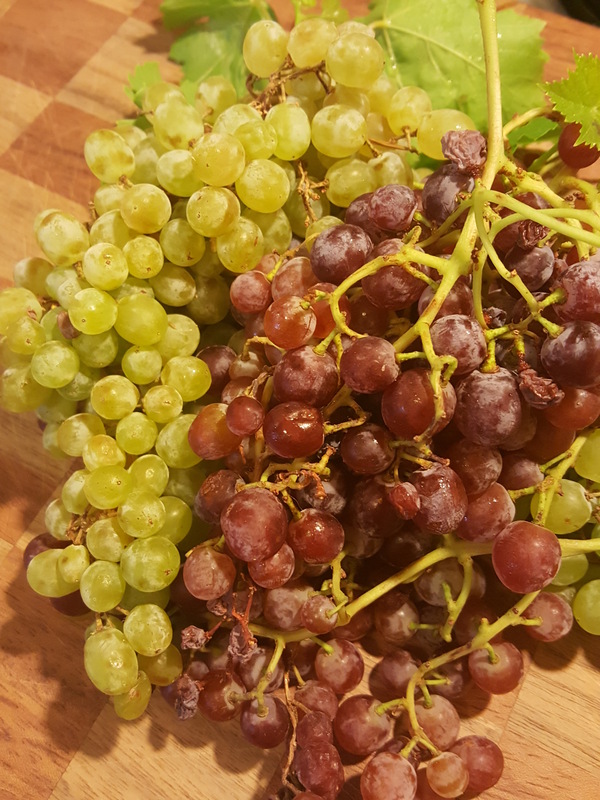 Native People know how to rally, to harvest in the times of plenty and to store short-lived fruits of the desert against lean times–lessons worth exercising. 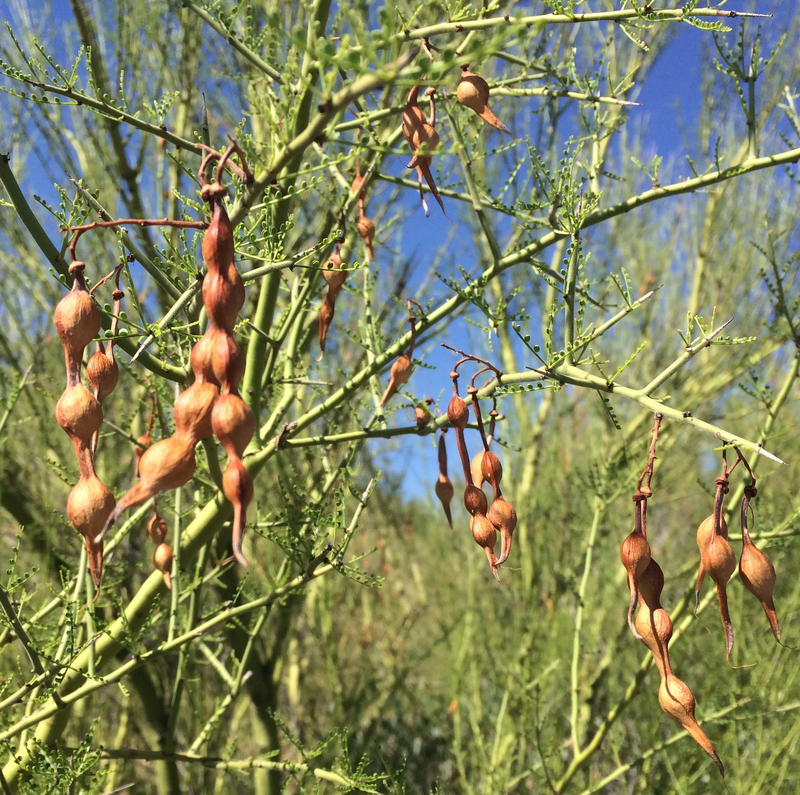 Plentiful foothills palo verde seeds (Parkinsonia microphylla) are a case in point. 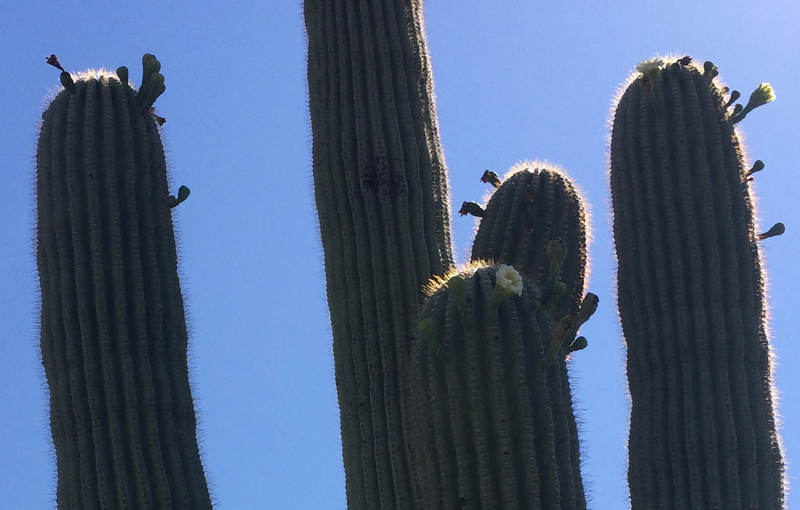 Mature dry pods of foothills paloverde–with potential for making nutritious flour! At PRESENT, lasting perhaps through July, there are copious “fruits-of-the-desert” hanging on foothills palo verde trees (aka little-leaf paloverde) covering desert hillsides. In early June, palo verde pods were offering soft sweetpeas for fresh picking (described in the June13,2015 Savor blog on this site). Now in July, palo verde pods are rattling with shrunken stone-hard seeds. 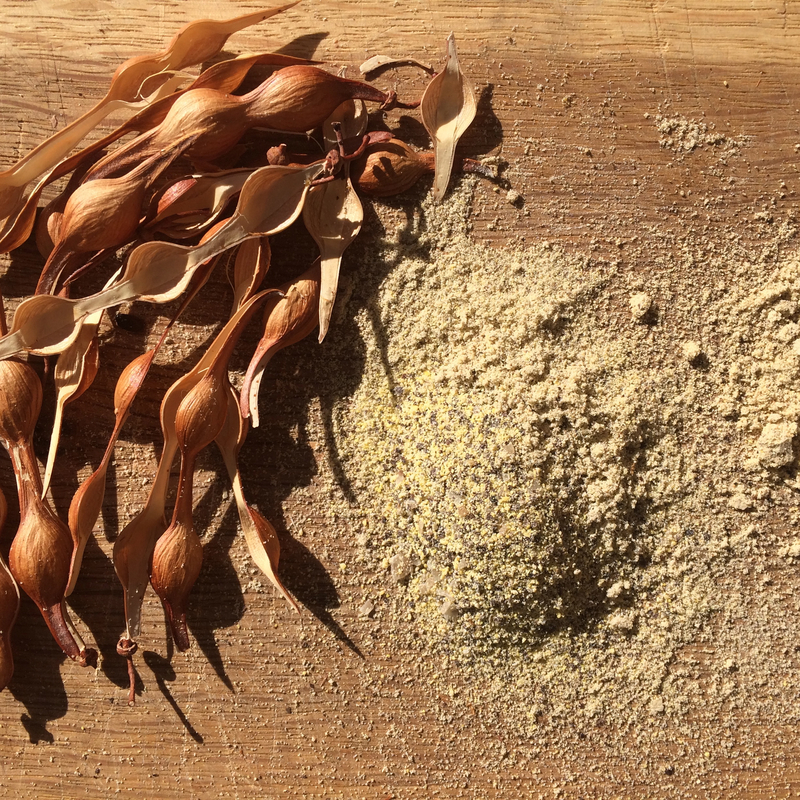 When ground, or when toasted and milled, these little dry seeds can produce two fabulous gluten-free flours for adding to baked goods, hot cereal, gravies etc. Oh how I wish that technology could keep up with our needs for scratch, sniff, and taste in this blog!! 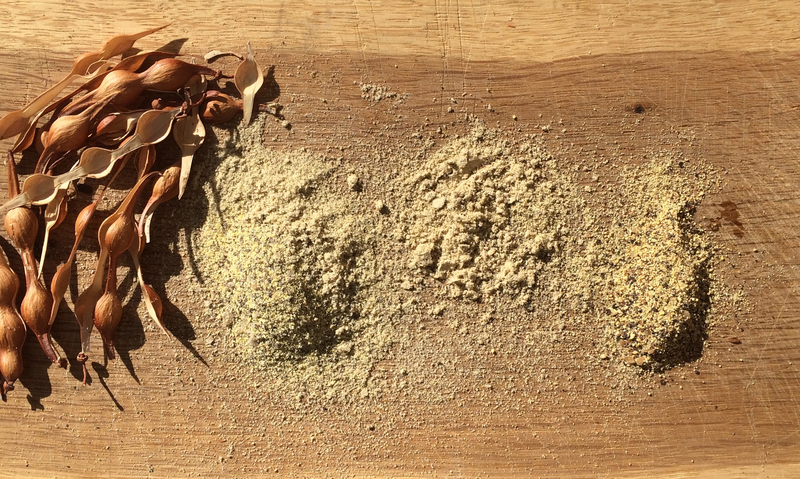 The distinctly different flavors and textures of these two flours are so pleasant. Desert People traditionally parched and ground these seeds in bedrock mortars. I used a coffee mill to grind them. The raw flour has a wonderful bean-i-ness bouquet coming through. Then I toasted (parched) a separate batch of seeds in an un-greased skillet before milling, and WOW the roasty aroma of this gluten-free flour is rich. I am using it to add flavor –not to mention high protein and complex carbs–to multigrain breads and biscuits. So FULFILLING! 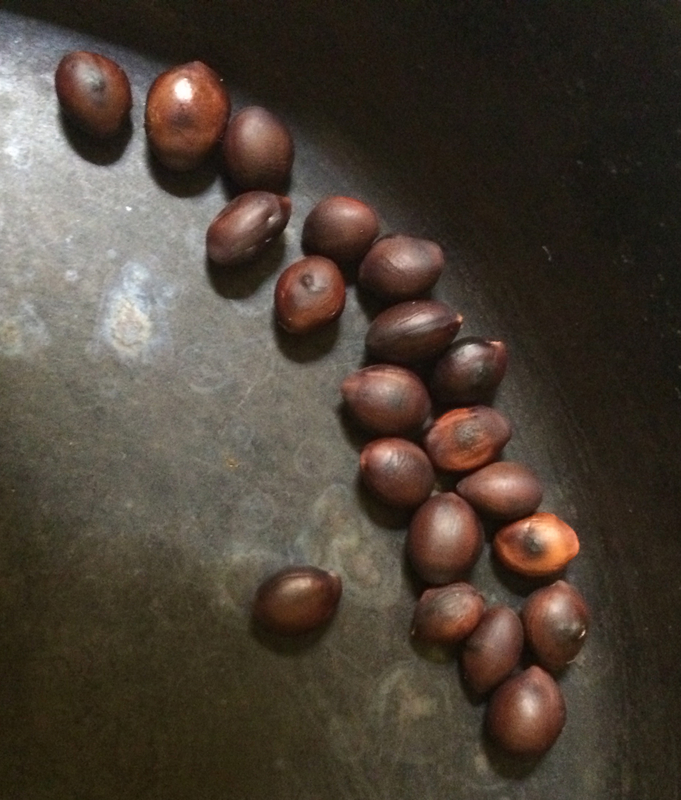 A friend who tried these different preparations for palo verde flour even wants to use it as a spice or seasoning! Years ago I collected seed for it near Alamos, Sonora, and grew it out in Tucson. Surviving frosty winters, and flowering in previous years, it never bore fruit before. 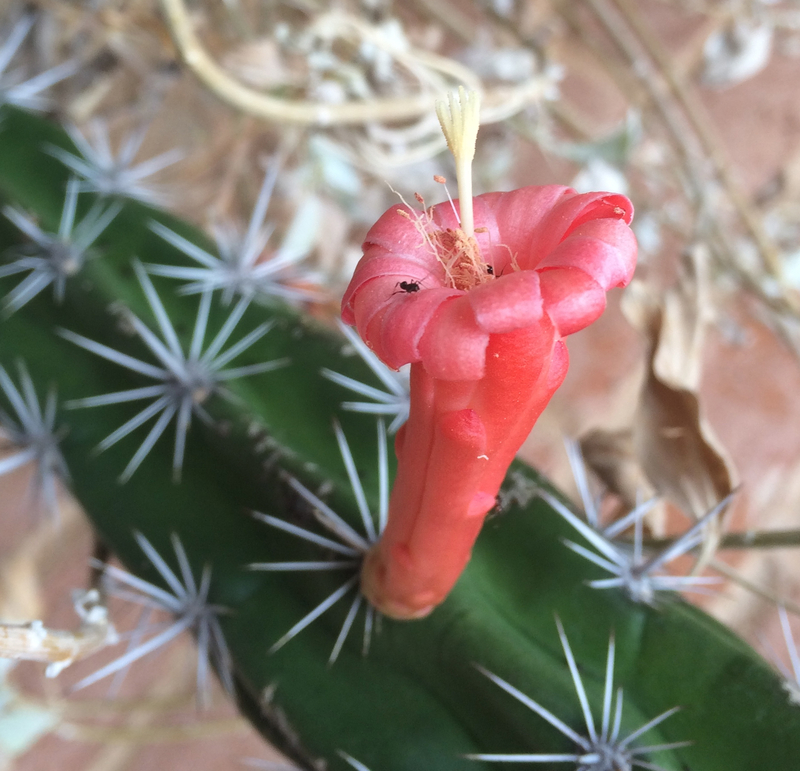 This year, fertilization happened at last, and voila–there are sensational, gently sweet delicacies to eat right off the cactus. The fruit’s fresh crispy texture is like watermelon and its seeds are tiny protein crunches. 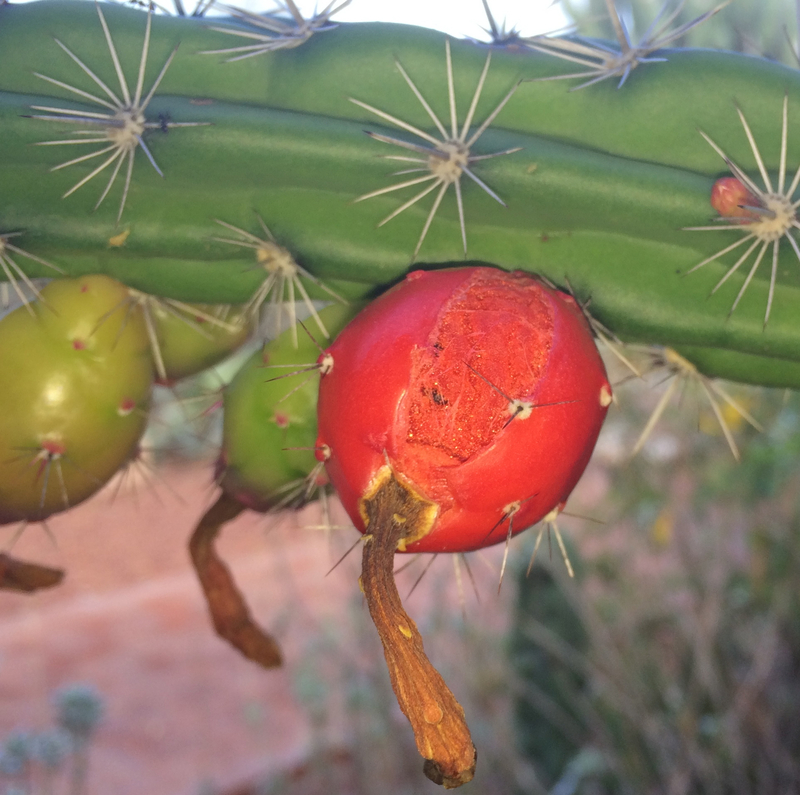 [Light bulb idea]–With climate change, this flavorful cactus fruit–and others like it–could become an appropriate specialty food to grow locally. 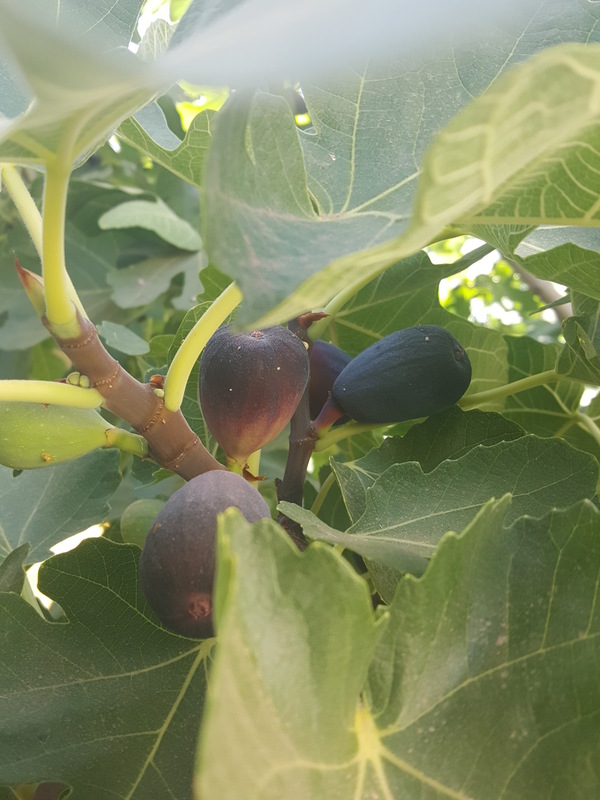 Green swelling Padre Kino fig–Young trees are available next week at the NSS plant sale! 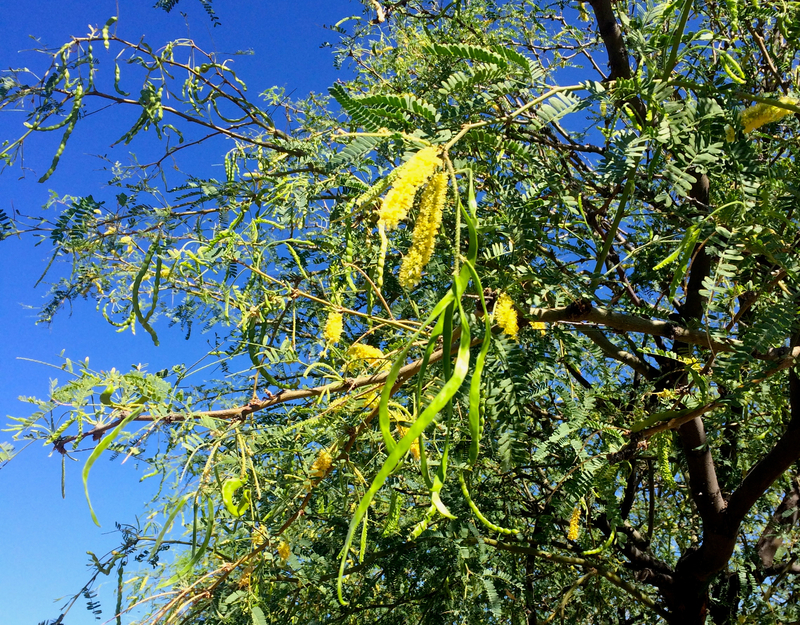 A new wave of mesquite flowers and green pods promise a second harvest this season. Don’t miss the NativeSeeds/SEARCH Monsoon Plant Sale this next weekend, Friday-Sunday, July 15-17, 2016! For your own garden-to-table promises and preparations, check out the many starts of NSS heirloom summer vegetables and monsoon wildflowers. There will be tomatillo plants, heirloom chile varieties, cucumber, many squash and melon varieties to give your garden a jump-start. 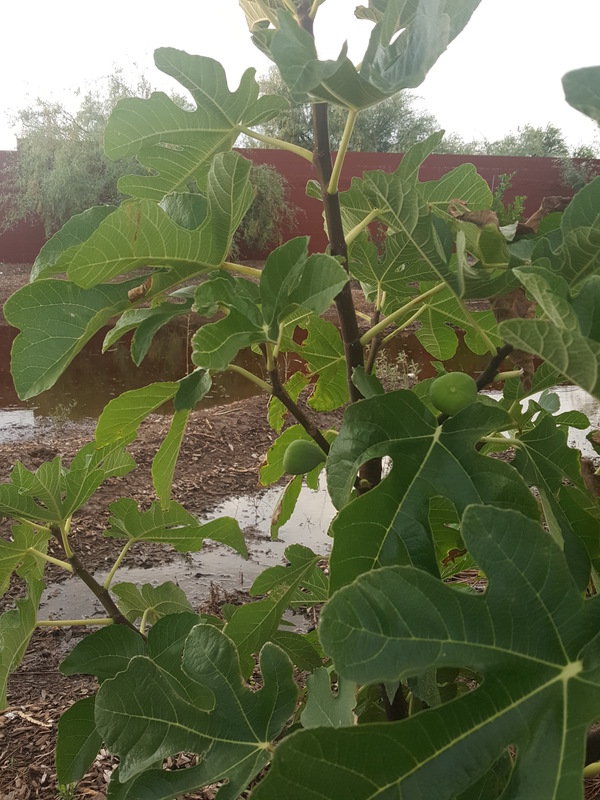 A few 5-gallon Father Kino fig trees propagated at Mission Garden will be available for sale, so come early. For well-seasoned ideas for desert cookery, two fabulously useful books continue to inspire: Tucsonan Sandal English’s cookbook from the 1970’s Fruits of the Desert published by the Arizona Daily Star, and desert-foods aficionado (& Blog-Sister) Carolyn Niethammer’s book Cooking the Wild Southwest published by University of Arizona Press. Borrow or buy, and use them with joy. I wish you happy harvesting as the desert’s present promises become a cornucopia of fulfilling plenty!